— Richard Milne (@rmilneNordic) 5 апреля 2016 г. “The Prime Minister has not resigned and will continue to serve as Chairman of the Progressive Party,” reads the statement posted late on Tuesday, which, among other things, lists the achievements of the government in the sphere of economy and praises the reforms initiated by Gunnlaugsson during his term. The PM once again insisted that he was innocent and denied all allegations that he or his wife were complicit in the tax fraud. What a bonkers day in Iceland. PM resigns, only for PR to claim he didn't. PM and president basically accuse each other of lying. And tmw? “The Prime Minister and his wife have provided detailed answers to the questions about the assets of PM’s wife. They have never sought to hide these assets from Icelandic tax authorities,” continues the statement made public on Twitter by Richard Milne, a correspondent with the Financial Times. — Edward Snowden (@Snowden) 5 апреля 2016 г.
Gunnlaugsson thereby argues that “no parliamentary rules on disclosure have been broken,” so there is no compelling evidence for him to resign. The PM’s position will be temporary held by Sigurour Ingi Johannsson, Iceland’s Minister of Agriculture and Fishing, who has been serving as deputy chairman of Gunnlaugsson’s Progressive Party. Media reports had surfaced earlier suggesting that Gunlaugsson had already submitted his resignation and was only waiting for the approval of his coalition Independence Party and President Olafur Ragnar Grimsson. Sigurour Ingi Johannsson was named as the first candidate in line to replace the disgraced PM. Gunnlaugsson first tried to seek the dissolution of parliament, but his request was turned down by President Grimsson. The Icelandic politician is believed to be the first victim of the massive offshore holdings leak known as the Panama Papers. According to the revelations, Gunnlaugsson concealed millions of dollars worth of family assets when he and his wife set up a company in the British Virgin Islands, reportedly in an attempt to evade paying taxes. 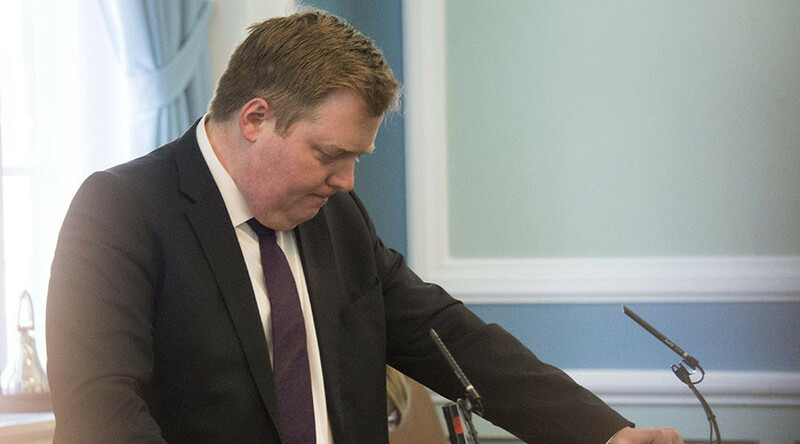 In the light of the massive leak, Iceland's left-wing opposition has presented a motion of no confidence in the center-right coalition government headed by Gunnlaugsson. The Icelandic PM has resigned. Flashman Cameron and his tax-avoiding family and front- bench should follow suit. Follow the money, always. Thousands of people took to the streets in the capital Reykjavik on Monday, demanding impeachment and new elections. The protest in front of the parliament was said to be the biggest in the country's history, with more mass demonstrations having been planned for later on Tuesday. Earlier on Monday, Gunnlaugsson told the parliament he would not resign amid the protests linked to his alleged financial affairs, which potentially represent a conflict of interest. "I have not considered quitting because of this matter nor am I going to quit because of this matter," the PM told parliament, as quoted by AP. The defiant politician then added that his government "has had good results... and it is important that [it] can finish its work." Another resignation linked to the leaked data was announced this week, when a regional head of Transparency International, an organization that seeks to monitor and root out corporate and political corruption worldwide, stepped down. Gonzalo Delaveau, the president of the NGO’s Chilean branch, has resigned, Reuters reported. Although he was not directly implicated in illegal activity by the Panama Papers, the documents showed Delaveau was linked to at least five offshore companies.